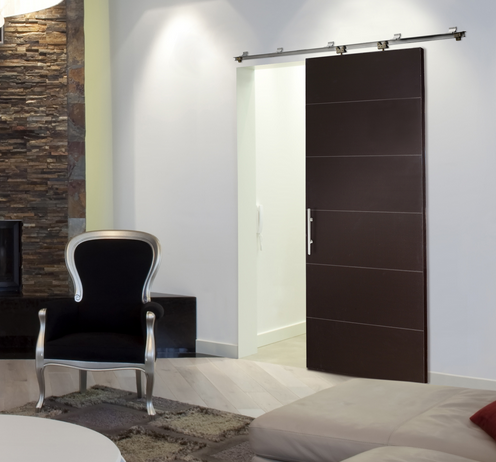 TAMPA, Fla. (June 2012) – Inspired by the classic sliding barn door, global door manufacturer Masonite® recently debuted a surface-mounted hardware system designed to hang Masonite interior doors. Featuring a tubular aluminum track and ball bearing rollers, the system allows interior doors to open and close quietly while adding visual interest to any living area. An added bonus for homeowners: the hardware system can be easily installed because it doesn’t require cutting into the wall. “It’s an excellent project for the DIY enthusiast,” continued Kometer. The track accommodates 1-3/8 inch single and double interior doors whether molded panel, wood panel, French, or Flush, with a combined weight up to 300 pounds and fits openings of 48, 60, 72 or 96 inches. It can also be trimmed to fit smaller openings. The interior sliding door system includes an I-Beam track, adjustable rollers (two per door), brackets, track stops, door guides and assembly tools. It is available at authorized Masonite dealers. Masonite is one of the world’s largest manufacturers of interior, exterior and patio doors for residential and commercial applications. For more than 80 years, the company has been committed to building enduring products and simplified solutions through innovation. Headquartered in Tampa, Fla., Masonite employs more than 7,000 people worldwide. To find a dealer or retailer near you, or for more information, please visit www.masonite.com.